The beaches along the Space Coast can be divided into several different sections based on the "topography" of each area. Starting at the North end, Canaveral National Seashore stretches from just south of New Smyrna Beach south to Port Canaveral and has a sandy bottom. It can be accessed from New Smyrna Beach on the North end and from Titusville on the south end at Playalinda Beach. From Playalinda Beach south to Port Canaveral is off limits due to NASA and Canaveral Air Force Station. 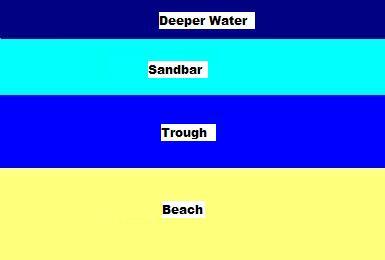 A trough generally forms just offshore of the shorebreak, followed by a sandbar and then deeper waters. 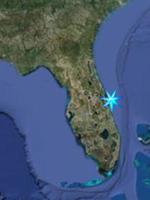 South of Port Canaveral are the towns of Cape Canaveral and Cocoa Beach. Here the bottom is again sandy but slope of the beach into the water is shallower and does not form as pronounced of a trough. This is likely due to the jetties of Port Canaveral interrupting natural sand flow. From Patrick Air Force Base south to about the Town of Indialantic, there are coquina ridges and attached to some of these reeflike structures are Sabellariid Worm Reefs made up of colonies of Sabellariid Worms. Around Indialantic, the reef structures give way to sand only beaches. From here south through Melbourne Beach to Sebastain Inlet the trough here is very pronounced and afer the first sandbar the water gets deeper. Fishing the Trough; The trough that forms between the shorebreak and the first sandbar runs along the beach like a fish super highway. You can see it high tide with enough wave action. As a wave approaches the sandbar it will grow steeper, then break over the bar. After it breaks on the bar it will reform and the foam will be reduced. The wave will then break upon the beach. As the wave breaks it dislodges small invertibrates such as sand fleas and other small organisms from the sand and washes them into the trough. Whiting, croakers pompano and other species will swim along the trough searching for these food sources. In fact if you watch closely, you will see juvenile whiting and pompano swimming up onto the beach to quickly feed with the wave, then scurry back to the trough as the water recedes. Glass minnows and mullet will also swim through the trough. The presence of these fish will then draw larger gamfish like snook, which love croakers, bluefish and sometimes spanish mackerel. During calmer days this area can be effectivly fished with lighter tackle in the 8-12 # range as mentioned on the Basic Surf ackle page. Higher tides are the best time. At lower tides, particularly at Canaveral Seashore, the trough becomes generally too shallow to fish. Rips; A rip current occurs when wave action forces large quantities of water over the nearshore sandbar into beach which flows back into the trough afetr the wave breaks and the water receeds into the trough. As the shallows of the bar prevent the water from flowing back out to sea as fast as it is coming in the pressure grows inside the trough until it forces a break in the sandbar. When this happens, water will begin flowing parallel to the beach towards the cut and by the time it reaches the cut a large quantity of water will a "rip" current flowing through the cut into the deeper water beyond the sandbar. 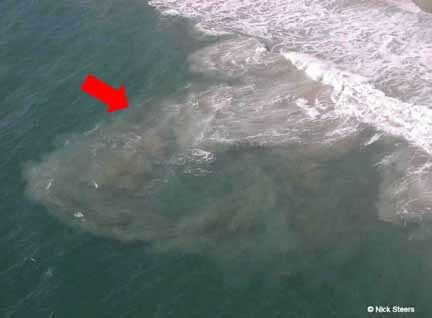 For swimmers, this can be a very dangerous situation as explained below, but for surf fishers it can be a goldmine. Those same waves that are pushing all of this water over the bar and crashing on the beach are also dislodging sand fleas and other small invertibrates out of the sand and disorienting small fish. The currents sweep these baits towards the rip current and out the cut. Predatory fish will wait along the edges and just outside of the cut and feed. By observing the waves as they come in, rip currents can be fairly easy to identify as waves do react to rips In this photo, the rip current has slowed the section of the wave over the rip. This combined with the deeper area of the cut has also prevented it from breaking and robbed if of its energy while the sections of the wave to either side are breaking. Also observe the foam left over from breaking wave in the trough. It will float parallel along the beach with the side current until it reaches the rip, then head out. Also this area will sometimes look just a bit choppier. In the aerial photo just below, made available to the public domain by the National Weather Service you can clearly see the surface foam, and in this case sand being washed to sea by a strong rip current. Again, these are for fishing, not swimming, and do not attempt to wade fish in a rip. Stay on the beach. I've cast pompano jigs into these and let the current carry the lure out. It works. Warning; If swimming and you find yourself caught in a rip, do not attempt to swim against this current towards the shore. It will be too powerful. 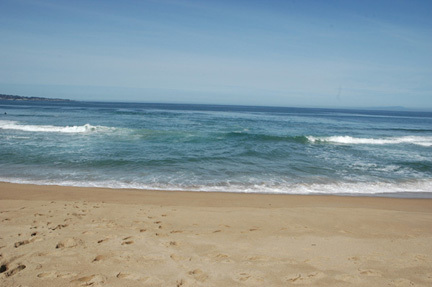 Swim parallel to the beach until you get to one side of the rip, then head towards shore. Coquina Ridges and Reefs; Fishing the coquina ridges from Patrick Air Force Base south to Indialalantic present some great fishing opportunities as well as some distict challenges. The structure of the coqina ridges promotes the growth of algea, sponges, and other clinging inverts while small crabs, shrimps and other crustaceans hide among the nooks and crannies among the rocks. This draws a great variety of fish such as margates, sheepshead, croakers, pompano, whiting, and black drum. The challenge is keeping your rig from getting snagged, or at least minimizing the number of times you do get snagged. If you use the standard pyramid sinker used for surf fishing along other Space Coast Beaches, you are going to get snagged just about every cast, and likely lose your rigging. For this area I recommend replacement of the pyramid sinker rig with the bank sinker rig described on the Surf Tackle and Rigging Page. As mentioned on that page, it will not totally eliminate the possibility of getting snagged but will reduce it somewhat. If the water is fairly clear and you can see where the bottom is rock and where it is sand, try to cast close to the structure without actually casting on top of it. In areas where the rock is close to shore, short precisely placed casts will work well. As a kid in Indian Harbour Beach my childhood friends and I used to fish among the Sabellariid Worm mounds which were very prevelant back then with nothing more than a length of fishing line tied to the end of an old fishing pole, and a hook baited with sand fleas caught on the beach. We would walk along the coquina ridge when it was exposed at lower tides and drop the hook on the seaward side of a group of worm mounds. We often outfished the adults who were casting offshore with rod and reel. The coquina ridges also draw snook looking to capitalize on the abundance of bait at the ridges. These can be fished for using surface plugs, floating diving plugs, spoons, and other lures fished over and near the reef structure. Best during higher tides that coincide with first and last light of the day. Whiting are the one of the most common fish along the Space Coast and are caught most of the year on pieces of shrimp, fresh cut clam, and sandfleas. These are great eating and the catch is not regulated. Pompano can be caught nearshore in the "first trough or outside the sandbars, as they search for their favorite food, sandfleas. Maximum size is about 8 lbs with their average being about 1 1/2 to 2 lbs. Great eating, and size and bag limits apply.Click here for current fishing regulations. 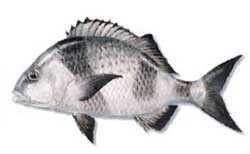 Black Drum are usually found in the surf near some sort of structure but can also be caught over sand bottoms as well. They can range up to 110 lbs but the average is much smaller. Drum can be good eating but the quality drops off once the fish grows beyond about 5 pounds. Size and bag limits apply. Click here for current fishing regulations. Sheepshead are another species that prefer structure, and commonly eat small crabs, barnacles, small bivalves and other creatures found attached to structure. Occasionally found over sand bottoms. Good eating and size and bag limits apply. Click here for current fishing regulations..
Snook can be caught along the beaches, particularly the beaches from the Indian Harbor Beach area south to Sebastain Inlet. They will eat live shrimp, croakers, pinfish, and readily take jigs, plugs, and other lures in the surf. Always use a fluorocarbon leader when targeting snook as they have an abrasive mouth as well as razor sharp gill plates that can also cut your hand if improperly handled (been there, done that). Strong fighters when hooked and will often jump. They can reach about 50 pounds with the average being 5 or 6 pounds. Snook are a subtropical to tropical species and cannot tolerate cold water so the best fishing will be summer and fall. Great on the table! Closed seasons (Catch and Release) and slot limits apply. A"Snook Tag" must be purchased to keep one. Click here for current fishing regulations. Tarpon can be found along the beaches, especially when the mullet are running. They will attack topwater and subsurface plugs, spoons, jigs, and soft baits. Shrimp, mullet, and other live baits also work. They will also take dead fish off of the bottom. However, when the mullet are actively running along the beaches it is probably better to "match the hatch", ie, either use live mullet or artificials that resemble mullet or at least baitfish such as spoons and plugs. These fish have very tough mouths to set a hook in and do require the use of a fluorocarbon leader. The best areas to try are the beaches near Sebastain Inlet. Not much food value but a "Tarpon Tag" is required if you want to keep one for mounting. Click here for current fishing regulations.